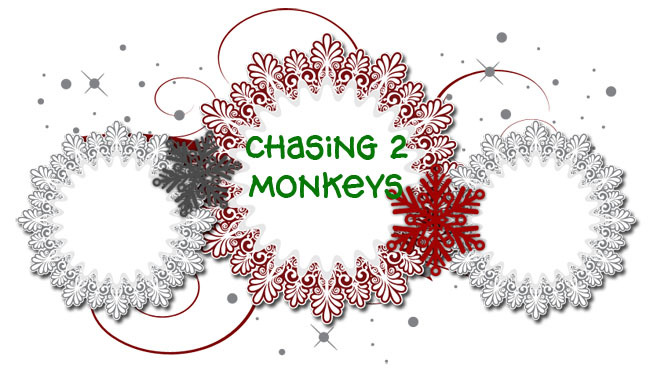 Chasing 2 Monkeys: 12 Days of Pinterest: Day 12: Series "Wrap" Up! If you're on Pinterest, then no doubt you've seen all the beautiful ways you can wrap gifts in brown paper. I had pinned the stamped one before by Jen Jafarzadeh L'Italien of The Haystack Needle, and I thought it's be a really great idea and would tie in perfectly with my "Handmade Christmas". However, for some reason I cannot find my "E" or "P" stamps anywhere!!!! Almost everyone in our families has an "E" in their names, so this was really disappointing and frustrating to me. 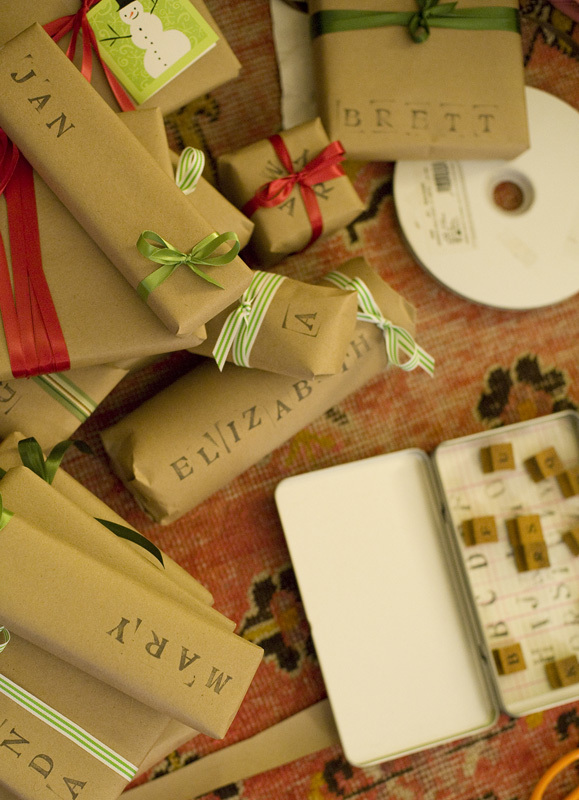 I also saw gifts wrapped with brown paper and using snowflakes for a decorative touch. Super cute! This one is done by one of the fabulous blogs I follow, How About Orange by Jessica Jones. (Anyone who knows me, knows I love orange, so this blog is a great fit!) 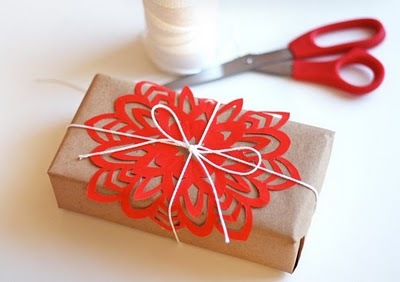 She even includes a great tutorial on how to create these awesome 6-point snowflakes! 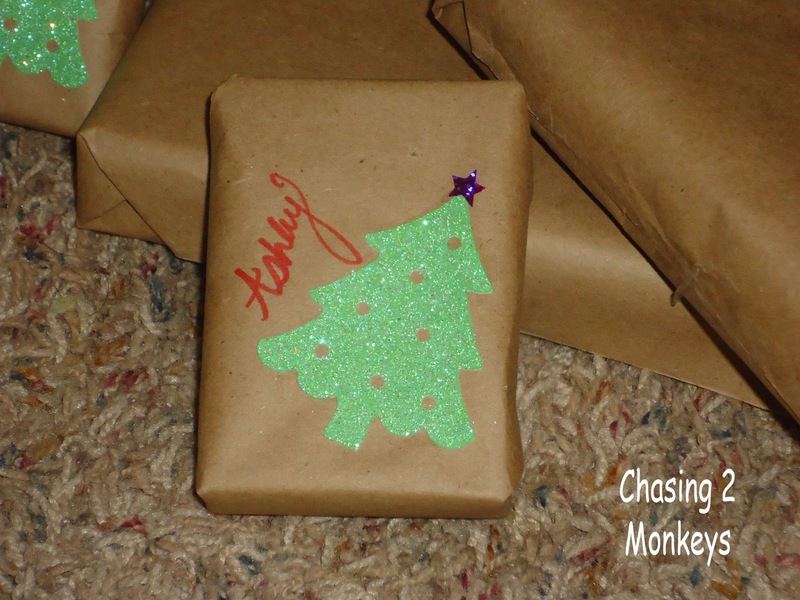 So for my wrapping, I used brown paper (bought at the Dollar Tree; it's actually brown postal paper) and used my Cricut to cut out glittery green trees (from "Create A Critter" cartridge). I had tried to cut snowflakes out on the Cricut, but because I was using an old mat and white glittery paper (I didn't want to muck up my new mats with glitter) they kept getting snagged and gnarly, so I had to 86 that idea. Then I punched a couple small holes in the trees to act as ornaments, put a star sticker on the tops, and wrote each child's name in red marker. I think they turned out really cute! 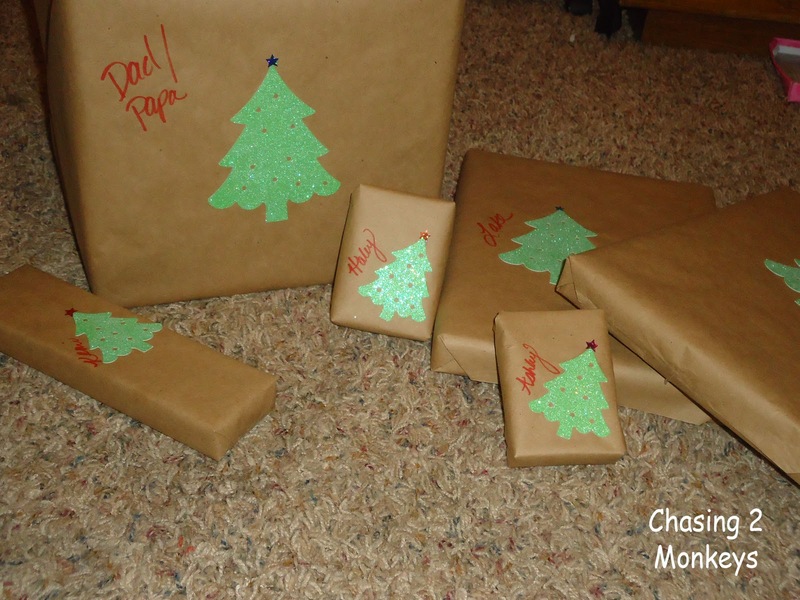 Well folks, that "Wraps" it up for the 12 Days of Pinterest series! Whew, and all before Christmas! Kinda proud of myself because I had to seriously consider my propensity to procrastinate when starting this and thought it would take me at least until the 26th to get everything up. But I did it!